Kim Jong Un tries out virtual reality at the China Academy of Sciences in late March 2018. 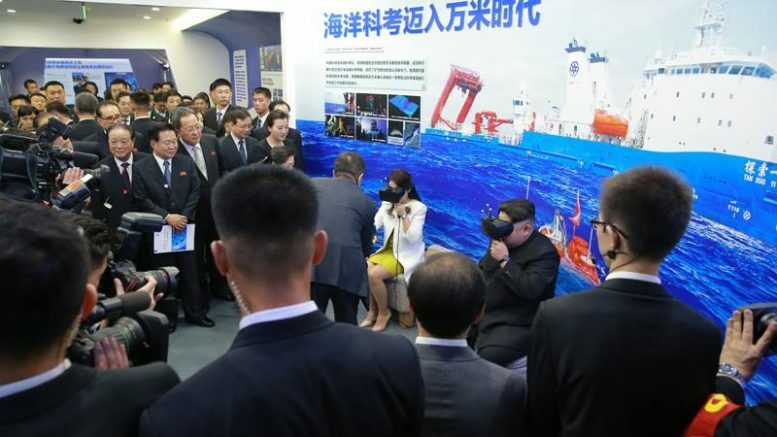 Kim Jong Un experienced a virtual reality demonstration as part of his recent visit to Beijing. In a photo issued by North Korea’s state media, the leader and his wife are seen each seated with VR headsets on. No other information about the demonstration was offered, but it appears to be a simulation of a deep-sea submersible. The demo came on March 27 during a visit to the Chinese Academy of Sciences as part of a trip to Zhongguancun, a district in Beijing that is said to be home to nearly 20,000 high-tech companies. Kim Jong Il visited the same area when he was in Beijing in 2011. A documentary on his Beijing visit, broadcast earlier this week on Korean Central Television, didn’t show any additional scenes of Kim at the VR exhibit. But it did show him looking around other exhibits, including FAST, the five-hundred-meter aperture spherical radio telescope in Guizhou province, and appearing to be amused by a humanoid robot. 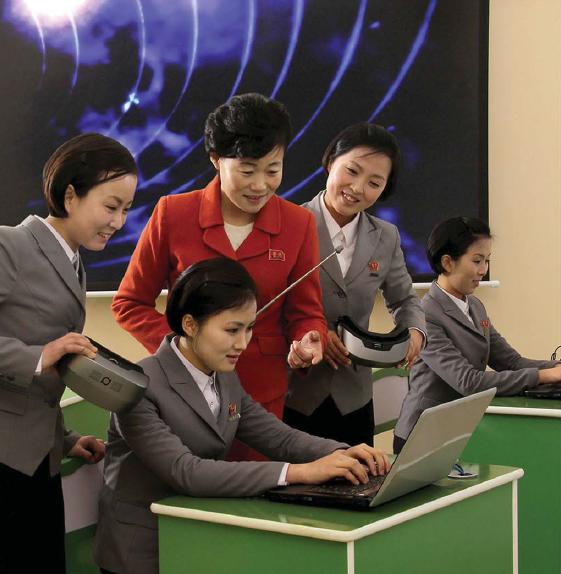 Meanwhile back home, teachers in Pyongyang are also learning about virtual reality. The March edition of DPR Korea magazine includes a feature on the recently renovated Pyongyang Teacher Training College (평양교원대학). It includes a photo of two students holding VR headsets while another works on the laptop. NK News identified the headsets as coming from Shanghai-based DPVR, a leading Chinese VR headset maker. The model in the picture appears to be the M2 Pro, which costs from $480 to $850, said the report.